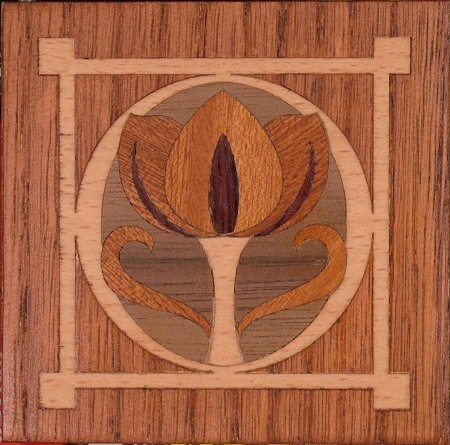 Here's a quick look at the application of a veneer made to produce a series of 3" x 3" blocks decorated with an abstract flower. This flower design was designed for Disney and was used on 54 wall mirrors in their hotel renovation and is available on this website. Four sheets of 4 flowers each are shown above. Each of the sheets shows the side to be glued down to the substrate. Here, one of the sheets has been glued to the substrate and the surface has been sanded smooth making it ready for stain and/or finish. I recommend the use of a vacuum bag for most installations. In the event you don't have a vacuum system, clamps and flat boards work just fine. 1. 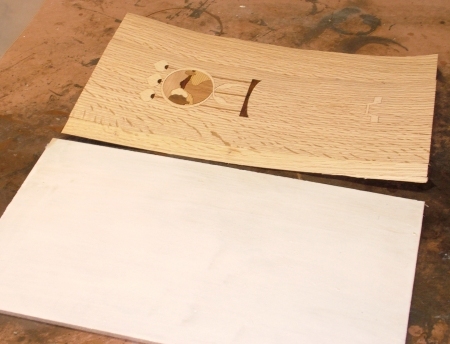 The piece to receive the veneer should be just a hair larger than the veneer sheet. This will help protect the delicate edges of the veneer from getting whacked during handling. Be sure the area to be veneered is flat and free of debris. Likewise, the back of the veneer (the side without any tape) must be free of debris. Yes, the veneer goes taped side up. The tape will be removed during sanding later. 2. Spread a high quality veneer adhesive or other similar to Tite-Bond I or II on the substrate about the same as you would latex wall paint. Adhesives formulated for veneers have larger particles and tend to be drier which helps to limit 'bleeding through' to the surface, but are not vital. I use Tite Bond II. I allow the surface a few minutes to 'tack' a bit and test by looking to see if a finger print can be left behind. Soggy is bad, dry is bad, tacky is good. 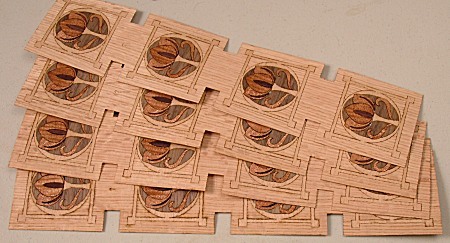 Veneer supplies and vac systems can be found at joewoodworker.com. I use a 4" wide rubber roller to spread the glue and roll North/South then East/West until the surface is coated with about as much glue as if you were putting latex paint on the wall. Remove what you don't need if it's soupy. Roll it out until you can just leave a finger print on the surface, but with no dry spots. If you drag your finger and get a furrow, that's too much and too wet. This will take a few minutes, the goal is to evaporate some of the moisture. 3. 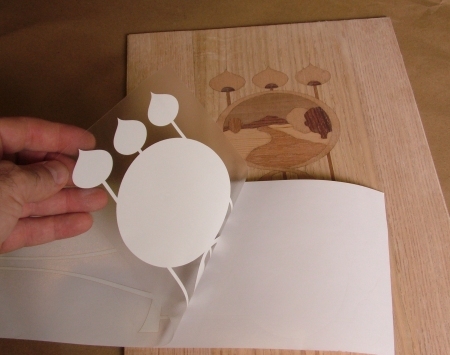 Lay the veneer on the substrate and tape in a few spots along the edges to prevent shifting. 4. 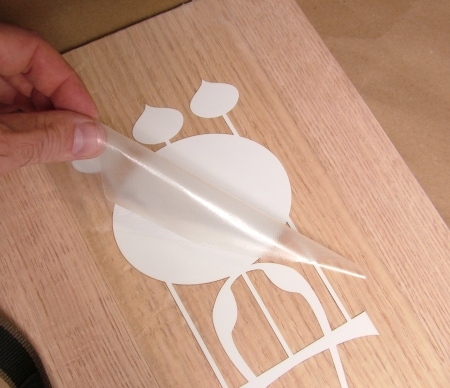 Place the part into a vacuum bag or between two boards. If using the board-clamp method, place a few paper towels on top of the face veneer. This will push the thinner veneer woods closer to the substrate's surface and will soak up any squeeze-out. 5. Move quickly so the veneer doesn't swell and wrinkle. Clamp the bejeebers out of it. A wrist-tight clamp every 4 inches is just enough. Note: a car's tire (while on the car) parked on a 12" x 12" board delivers only half the pressure of a vacuum system. You can't beat vacuum. 6. Allow this to sit for a few hours and remove. Once very dry, sand with 100 grit to quickly level all of the woods of different thicknesses. Progress carefully though to 120 or 180 grit. To keep track of your sanding progress, scribble all over the surface with a pencil. When the pencil goes away, stop and progress to the next finer grit. Available for all inlay designs, a stain blocking stencil blocks out the lighter woods so a stain may be easily applied to the background. 2. Lift the clear carrier sheet from the slippery backer sheet. 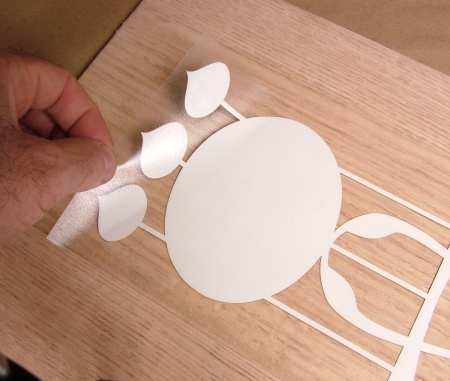 The vinyl stencil MUST stay attached to the carrier sheet and shouldn't be allowed to shift. Work slowly and carefully. 3. 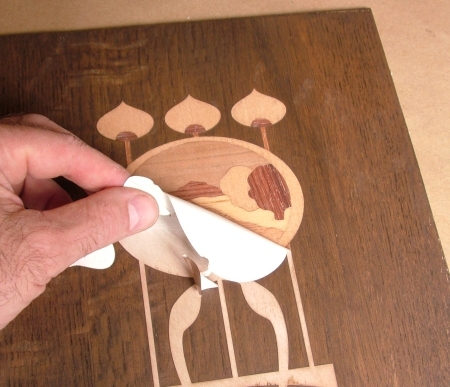 Carefully align the stencil with the inlay. The carrier is clear - good thing, huh? 4. When you're happy with it's location, roll the stencil down onto the surface. Now you'll know if your shop is as dust-free as you think it is. 5. Peel the clear carrier film off of the stencil. Pull at a sharp angle. Roll the surface again. The tighter the fit the better - remember, the whole point is to block stain from the surface of the woods used in the design. If there are any stray sections of stencil blocking areas that need to be stained, lift these off of the surface with a pin or tweezer. Only the inlay design should be covered. Applying stain to this area will NOT be a 'flood-it-until-it-drips-on-the-floor' deal. NO! Too much stain now is BAD! To prevent the stain from wicking under the stencil, apply your stain as dry as humanly possible when working around the edges of the stencil. 6. 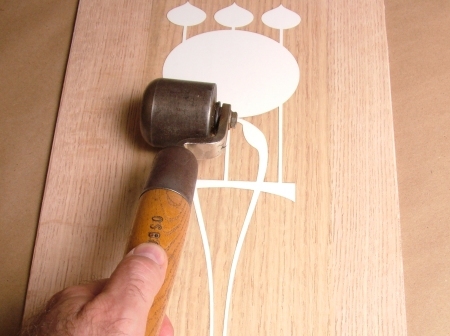 Allow the stain to set up and peel the stencil off of the surface and you are ready for finish.